Having not long had a baby and all these winter germs going round I’ve been washing my hands A LOT! They were really dry, cracked and sore. I’ve used the mitts today and can really see the difference, they feel so smooth. I wish I could afford to use them once a week to keep my hands soft. I gave these gloves to my husband whose hands were extremely dry and rough. He was astonished of the result; his hands were baby soft and all the dryness had disappeared. I wish I'd taken before/after pictures, because the effect was so great! 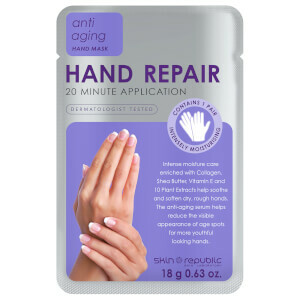 I always find that people’s hands are a huge giveaway when it comes to aging, so I am always interested in any product that will help prevent the causes of aging. This product is super simple to use and leaves your hands feeling soft after only 30 minutes. I will definitely be buying again! I'm not a massive fan of hand masks so don't use many, but this one is really easy to use, and my hands felt amazing afterwards. My only criticism is that it left a lot of serum afterwards, too much to rub in, so I did end up having to wash the remaining off! Love these before a holiday! 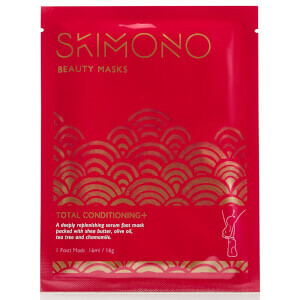 I love to use the Skimono hand masks just before a holiday as it makes your hands super hydrated and look their best. It's also great to use when it's really cold, as I get really dry skin in the winter months, and this mask just leaves hands feeling super soft. Love this product! Makes your hands feel conditioned and revitalised and leaves baby soft skin - would definitely buy again! Really easy to use hand mask, not messy like others i have tried and a greta value for money. Will buy again. This hand mask works perfectly and makes your hands feeling soft, nourished and healthy. It is also really easy to use and has a lovely scent. Would definitely recommend!